Heat oven to 425°F. Spray 15x10x1-inch pan with cooking spray. Rub chicken breasts with 1 tablespoon olive oil, then rub in Italian seasoning and 1/8 teaspoon salt. Place on pan. Roast 15 to 18 minutes or until juice of chicken is clear when centre of thickest part is cut (at least 165°F). In medium bowl, mix beans, spinach, 1 tablespoon olive oil, the pepper flakes and 1/8 teaspoon salt. 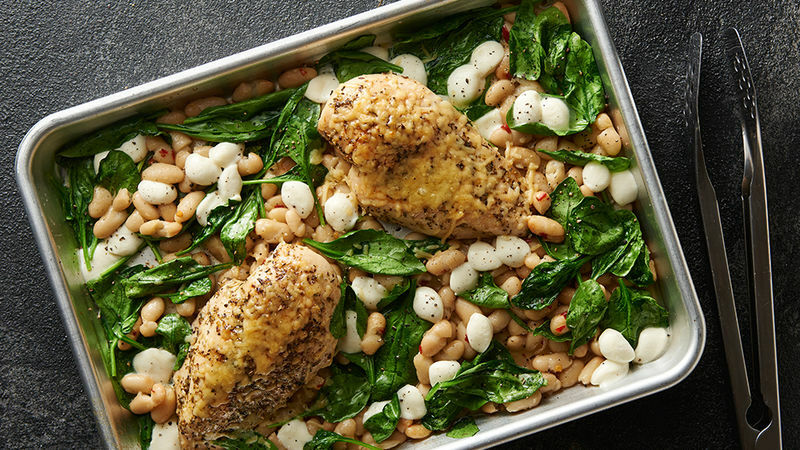 Arrange around baked chicken in pan. Top bean mixture with mozzarella cheese pearls. Sprinkle chicken with Parmesan cheese. Bake 2 to 4 minutes or until cheese begins to melt and spinach is slightly wilted. Experiment with different canned beans and baby greens – such as black beans and baby kale or chickpeas and baby arugula. Can’t take the heat? Use ground black pepper for instead of the red pepper flakes.